So I know I haven’t been doing blog entries lately. I’m not really sure why. There’s been a lot going on. 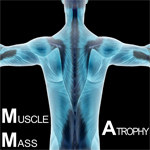 Muscle Mass is minimalist aggressive synth pop. I never quite figured out what chillwave is, but maybe it sounds like this?